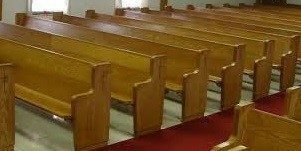 When looking online for “Pews for Sale” most people don’t think to look at purchasing used or refurbished church furniture. The truth is that older church furniture, from “back in the day”, is generally of higher quality, and specially constructed to withstand the test of time. Did you ever notice that your grandparents, and maybe even your parents, kept using the same tables, chairs, or dressers as far back as you can remember? It’s because they lasted! Older furniture was made out of solid wood, and masterfully crafted by hand, which means it was built to last almost forever. Today, however, most furniture pieces are made out of pressed chipboard and sealed with a veneer coating. While maintaining and proper care of veneer can help to preserve a piece of newer furniture, at the end of the day, chipboard and plywood are not as strong as solid hardwood. When looking for new church furniture, just remember, you get what you pay for. Essentially, if you’re looking at a big-box store, and they offer a variety of inexpensive options, remember that because it is inexpensive, it will probably not last as long. This same concept is worse when purchasing church furniture. With only a few manufacturers on the market, they can demand premium prices for low-quality furniture, which churches think they have no choice but to pay. This is where the used church furniture market makes their debut. At a fraction of the cost of buying it brand new, used and refurbished furniture looks great, is high quality, and will last! With even fewer places selling used church furniture than new, you might have to do a bit of searching. But it’s worth the effort, because you’ll be able to find the right look and style that best meets your needs, at an affordable price. Even better, most places that sell used church furniture will also repair, re-upholster and restore your existing pews, chairs, and other church furniture. So, when your church is searching for “Pews for Sale”, consider looking at used and refurbished church furniture! As an affordable alternative to buying it new, you’ll be getting unique furniture that was made to last! Born Again Pews offers a wide selection of beautiful, restored church furniture. Giving your congregation beautifully restored pew to further enjoy their weekly services on.